← Hyperlocal Business Blogging – a new trend? 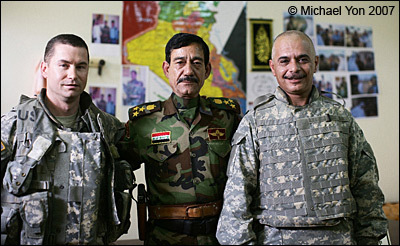 Lieutenant Colonel Doug Crissman arrests Iraqi hero General Hamid and averts a bloodbath. This is a story you will probably never see on major networks, in the Associated Press, or Reuters. It was the final act of a Tragedy that was played out in Anbar Province earlier this week and Michael Yon was there for us to record every moment of it. Iraqi General Hamid was one of the brave souls who took an aggressive stand against the Al Qaeda (AQI) terrorists who had made Anbar Province a slaughterhouse. He has long been viewed as a true hero by Americans and Iraqis. The fact that Al Qaeda beheaded his son on a soccer field in 2005 only added to his fearsome reputation as an unflinching hero. Unfortunately, General Hamid had recently turned to the dark side and was deeply involved in corruption and in unforgivable abuses of power. Iraqi officials wanted Hamid gone and they wanted Americans to arrest him. LTC Doug Crissman had the courage and the initiative to make a judgment call and arrest General Hamid at his own headquarters while surrounded by his followers. It is a story that will be studied for years to come. There are so many historical parallels that it made me shiver as I read it. It is called The Final Option. This entry was posted in News blogging and tagged Anbar Province, General Hamid, Greek Tragedy, Iraq, LTC Doug Crissman, Michael Yon. Bookmark the permalink.